I know how much you don’t want to be where you’re at. Being a drug addict, especially a heroin addict is such a painful way to exist, a dark pit of despair. Before I came to RDD I’d been through 7 rehabs and had been using heroin, methadone and other opiates for 13 years. I know all of the hurtful things that you do to others, to yourself, or that you let others do to you; and that each time a part of you diminishes, a piece of your soul dies. And it gets harder and harder to look at yourself in the mirror. I honestly do not know how or why but RDD has truly given me a new life, a new hope, something to hold on to in the darkest of my days. I know they can do the same for you. Please call them. It’s OK to be scared. If you’re like me, you’re probably scared all the time anyway, if you truly admit it to yourself. But they are the nicest staff I have ever met. They truly care that you get and stay clean and every single person there treated me with the utmost respect. At every other rehab I’ve been to the staff treated me like garbage. But that truly is not the case at RDD. And for anyone who wants to hear about my experience firsthand, I would be happy to make myself available. 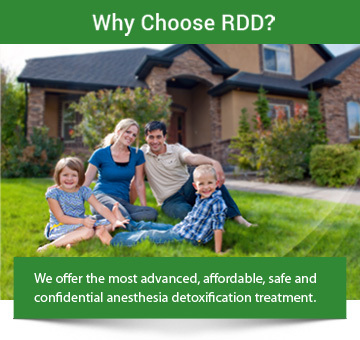 You can contact me through RDD, anytime. I truly mean it. Just do it! Thanks so much for always being there to answer my thousands of questions. You were always so kind, never impatient, and if you had another call, you always called me back promptly. You made me laugh and I just know you are a beautiful soul. The only regret is I did not meet you face to face. I still hope I get to someday. Thanks so much for all of your time, your patience and your endless bound of information.